Dealbh le dathan fìrinneach dhen Rìbhinn a chaidh a thogail le Mariner 10 's a phròiseasadh le dà chriathrag. Tha neòil pronnaisg thiugha a' falach a h-uachdair. B' e Bhèineas neo Rìbhinn an darna planaid. Is i an rud as dearrsach san speur againne as deidh, an Grian agus an Gealach, agus tha far-ainm aice - "a' Mhadainneag". 'S e Bhèineas am planaid as fhaisge dhuinn. Chan eil saideal aice. Ràinig na Sovietich Bhèineas sa chiad aite, leis na proban "Venera". chunnaic iad àile geur is garbh, agus talamh teth. Cha do mhair na proban ach mionaidean. Gu mi-fhortanach, cha bidh daoine a' fuireach ann a dh'aithghearr, agus gun teagamh, chan eil beatha sam bith air an talamh aige. Bha ceangail làidir eadar Bheineas agus Quetzacoatl, agus chleachd na Comunnaich i, mar seorsa seun, m.e. b' e The Morning Star, pàipear-naidheachd Comunnach. 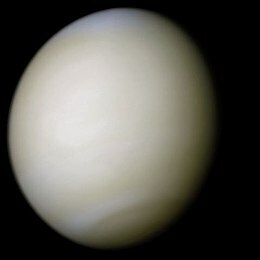 ↑ 1.0 1.1 1.2 1.3 1.4 1.5 1.6 Williams, David R. (2005-04-2005): “Venus Fact Sheet”. NASA. Air a thogail 12mh dhen Dàmhair 2007. ↑ Lorenz, Ralph D. (2001): “Titan, Mars and Earth: Entropy Production by Latitudinal Heat Transport”. Ames Research Center, University of Arizona Lunar and Planetary Laboratory. Air a thogail 21mh dhen Lùnasdal 2007 (PDF). ↑ Yeomans, Donald K.: “HORIZONS Web-Interface for Venus (Major Body=2)”. JPL Horizons On-Line Ephemeris System. —Tagh "Ephemeris Type: Orbital Elements", "Time Span: 2000-01-01 12:00 to 2000-01-02". (Bu chòir dha "Target Body: Venus" agus "Center: Sun" a bhith 'nam bun-roghainnean.) 'S e luachan na reul-cuairte pògaidh sa bhad air ceann-aimsir J2000 pongail a tha sna toraidhean. ↑ 4.0 4.1 Simon, J.L., Bretagnon, P.; Chapront, J.; Chapront-Touzé, M.; Francou, G.; Laskar, J. (sa Gearran 1994): “Numerical expressions for precession formulae and mean elements for the Moon and planets,” ann an: Astronomy and Astrophysics , leabhar 282, àir. 2, td. 663–683. Bibcode: 1994A&A...282..663S. ↑ 6.0 6.1 Seidelmann, P. Kenneth, Archinal, Brent A.; A'Hearn, Michael F.; Conrad, Albert R.; Consolmagno, Guy J.; Hestroffer, Daniel; Hilton, James L.; Krasinsky, Georgij A.; Neumann, Gregory A.; Oberst, Jürgen; Stooke, Philip J.; Tedesco, Edward F.; Tholen, David J.; Thomas, Peter C.; Williams, Iwan P. (2007): “Report of the IAU/IAG Working Group on cartographic coordinates and rotational elements: 2006,” ann an: Celestial Mechanics and Dynamical Astronomy , leabhar 98, àir. 3, td. 155–180. Bibcode: 2007CeMDA..98..155S. doi:10.1007/s10569-007-9072-y. ↑ Konopliv, A. S., Banerdt, W. B.; Sjogren, W. L. (sa Chèitean 1999): “Venus Gravity: 180th Degree and Order Model,” ann an: Icarus , leabhar 139, àir. 1, td. 3–18. Bibcode: 1999Icar..139....3K. doi:10.1006/icar.1999.6086. ↑ “Planets and Pluto: Physical Characteristics”. NASA. Air a thogail 26 dhen Lùnastal 2015. ↑ “Report on the IAU/IAG Working Group on cartographic coordinates and rotational elements of the planets and satellites”. International Astronomical Union. Air a thogail 12 dhen Ghiblean 2007. ↑ 10.0 10.1 Mallama, A., Wang, D.; Howard, R.A. (2006): “Venus phase function and forward scattering from H2SO4,” ann an: Icarus , leabhar 182, àir. 1, td. 10–22. Bibcode: 2006Icar..182...10M. doi:10.1016/j.icarus.2005.12.014. ↑ Mallama, A. (2011): “Planetary magnitudes,” ann an: Sky & Telescope , leabhar 121, àir. 1, td. 51–56. ↑ Espenak, Fred (1996): “Venus: Twelve year planetary ephemeris, 1995–2006”. NASA Reference Publication 1349. NASA/Goddard Space Flight Center. Air a thogail 20 dhen Ògmhios 2006. Air a tharraing à "https://gd.wikipedia.org/w/index.php?title=An_Rìbhinn_(planaid)&oldid=543425"
Chaidh an duilleag seo a dheasachadh 10 dhen Lùnastal 2018 aig 06:50 turas mu dheireadh.